Ile de New York, Partie de Long-Island ou de I'le Longue, et Positions des Armees Americaine et Britannique, Apres le Combat livre sure Hauteurs le 27 Aout 1776. 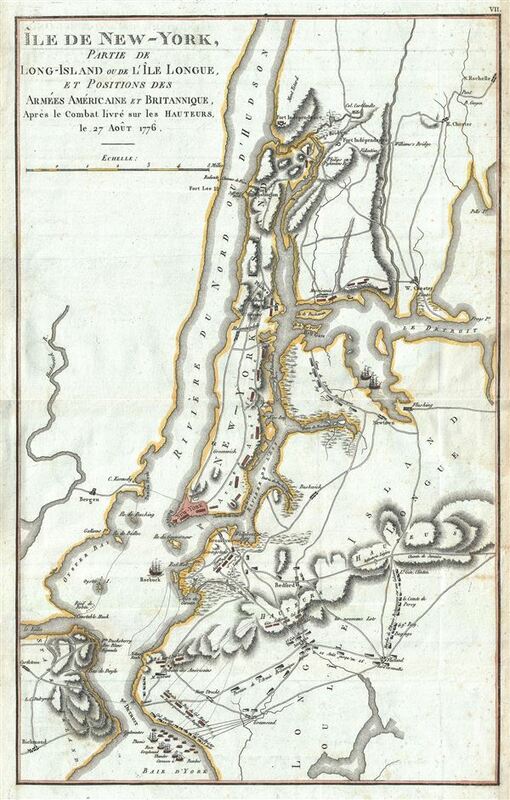 This is a rare map of New York City during the American Revolutionary issued for the 1807 French edition of John Marshall's The Life of Washington. The map covers the strategically important Manhattan Island and vicinity, including Staten Island, Brooklyn, Queens, and the Bronx. Various rivers, roads, and topographical elements are noted. The map also indicates the positions of the British and Continental forces as each attempted to maintain control of the region. Marshall prepared this map to illustrate the events leading to the British takeover of New York City and vicinity. Specifically, it details the Battle of Harlem Heights and the Battle of Long Island. In 1776 the British General William Howe, fleeing Boston, regrouped and landed his forces on Long Island and Staten Island. After defeating George Washington at the Battle of Long Island, Howe sized control of New York City and most of Manhattan. A series of subsequent skirmishes culminated in the Battle of Harlem Heights, in what is now Morningside Heights, New York City. Washington controlled the highlands and galvanized his troops to a strong defense, holding the heights against superior British numbers and firepower. Nonetheless, the position proved untenable and Washington and his forces retreated northward to Westchester County. Howe, keen to size the advantage, landed troops in Westchester, a flanking maneuver intending to encircle Washington's forces. Washington, alerted to the tactic entrenched himself in White Plains, but was unable to hold against Howe. Howe proceeded to drive Washington across New Jersey into Pennsylvania where he famously crossed the Delaware on December 26th to surprise a Brigade of Hessian mercenaries in the Battle of Trenton – a strategic Continental victory and major turning point in the war. This map appeared in French version of John Marshall's seminal work, The Life of Washington. Marshall composed the five volume biography between 1805 and 1807 and based the work on original papers and records provided by the president's own family. This map was engraved by Jean-Nicholas Buache de Neuville and appears in the 1807 French edition of Marshall's Vie De George Washington. Jean-Nicholas Buache de Neuville (February, 15 1741 - November 21, 1825) was a French geographer, cartographer, scientist, and map publisher active in late 18th century Paris. Buache de Neuville was the nephew of the more prominent French geographer Philippe Buache, who held the coveted post of Premier Geographe du Roi. The position meant that Philippe Buache was assigned to tutor the young Dauphin in Geography. Philippe Buache often brought his young nephew, Jean-Nicholas Buache to these secessions where he apparently developed an excellent relationship with the prince. After Philippe Buache's death in 1773 the position of Premier Geographe du Roi fell to J. B. B. D'Anville, who himself died in 1782. Jean-Nicholas Buache, now 41, was in an ideal position to take up the job and canvased his royal friend, now Louis XVI for the position. He became the Premier Geographe du Roi in 1782, beating out such strong competitors as Rigobert Bonne, Didier Robert de Vaugondy, and Edmonde Mentelle. Buache de Neuville compiled maps based upon geographic knowledge, scholarly research, the journals of contemporary explorers and missionaries, and direct astronomical observation. Nevertheless, even in 18th century Paris geographical knowledge was severely limited - especially regarding those unexplored portions of the world, including the poles, the Pacific northwest of America, and the interior of Africa and South America. In these areas Buache de Neuville, like his uncle, Philippe, and primary rival Robert de Vaugondy, must be considered a speculative geographer or 'positive geographer'. Speculative geography was a genre of mapmaking that evolved in Europe, particularly Paris, in the middle to late 18th century. Cartographers in this genre would fill in unknown areas on their maps with speculations based upon their vast knowledge of cartography, personal geographical theories, and often dubious primary source material gathered by explorers and navigators. This approach, which attempted to use the known to validate the unknown, naturally engendered many rivalries. Buache de Neuville's feuds with other cartographers, most specifically Didier Robert De Vaugondy, resulted in numerous conflicting papers being presented before the Academie des Sciences, of which both were members. The era of speculatively cartography effectively ended with the late 18th century explorations of Captain Cook, Jean Francois de Galaup de La Perouse, and George Vancouver. Marshall, J., Vie De George Washington, (Paris: Dentu) 1807. Very good. Minor wear along original centerfold and fold lines. Minor damp stain on right center margin. Blank on verso.